Has “working on yourself” become an ongoing, never-ending project? Does negative energy from others bother you more than it used to? Are you experiencing more and more episodes of “brain fog”? The 1980’s saw the start of a seismic shift in human awareness of energy in ourselves and others. Prior to that, what people did and said mattered to us more than the energy behind those actions. Then came 12/21/12. Obviously—despite predictions—the world didn’t end on that date, but there was a huge energetic change. Before 12/21/12, the “veil” (that made it hard for humans to sense energies) was thinning. On 12/21/12 it disappeared completely. Now, in everyday human interactions, we’re able to effortlessly shift awareness to the “vibes” and subconscious motivations of those we interact with. The potential to accelerate spiritual and psychological growth is dazzling. It’s a new era, with a whole new set of vibrational rules that few people are even aware of, which explains why spending more and more time on “personal-growth” work is bringing fewer results. Your investment? Far less time than you’re spending now on self-improvement. A new psychological stability can help you enjoy relationships more. And without having to work on your issues — or the other person’s…. Want to feel more alive and connected, humanly? 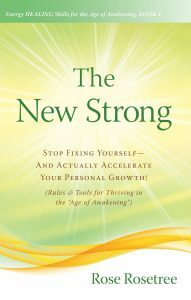 Ready to stop working so hard to “fix yourself,” energetically? Let this groundbreaking book help you use a clearer “energy awareness” to enhance your life—not become your life! It’s surprisingly easy to live extra-productively in the Age of Awakening.